CASE STUDY: Duke Construction used Air Energy “The Rack” ER systems to increase tenant comfort level in the space and reduce energy costs. Duke Construction wanted the design HVAC contractor to explore new ways to upgrade the low heating efficiencies of standard unit heaters and the constant moving of these heaters in their Type 2 spec buildings. PROBLEM: Older unit heaters were not providing the comfort level required by tenants for their employees. PROBLEM: On their Type 2 buildings, Duke had always used unit heaters in their spaces for heating. As a heating system, unit heaters were not only not economical to operate; they were not providing the comfort level required by their tenants for their employees. SOLUTION: By putting The Rack™ ER systems in the corners, they eliminated any future need to move the systems regardless of how the building space was subdivided. Along with not moving the systems, they increased the comfort level in the space and reduced the energy costs to the tenants. View additional “The Rack” case studies here. In this economy – energy efficient, quality built, and affordable ventilation and air distribution products are critical to keeping building temperatures consistent and energy costs low. Duke Construction knows about cost saving The Rack™ ER Units – and now you do too. SOLUTION: The Rack™ increased the comfort level in the space and reduced the energy costs to the tenants. 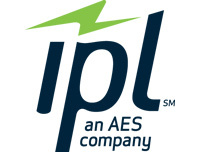 To learn more contact the Air Energy Systems sales office at (317) 290-8500 . Download a copy of The Rack™ brochure. Reduces the need for expensive roof structural steel. Eliminates roof penetration which causes roof leaks. Decreases the quantity of units needed to distribute the conditioned air evenly throughout the space. Maintains consistent temperatures throughout the work environment eliminating the need for expensive discharge duct work. Lowers installation costs with gas and electrical piping. Saves utility expenses in both natural gas and electrical consumption. 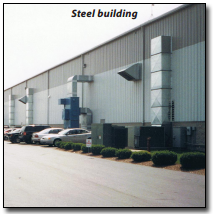 Our Case Studies prove The Rack™ is the best solution for Metal Buildings. Switching from Angle Iron to a Galvanized Tube Steel Frame led to lighter overall weight, elimination of wooden pallet, cheaper shipping costs and quicker installation. Adjustable Brackets on the back frame allows for The Rack to accommodate all styles of unit heaters, effortless installation and easier service entry. A completely redesigned Control Panel resulted in clear access to controls, straightforward wiring process and speedier service time. Our New Control Panel will ship straight up. Once on the jobsite the panel will hinge down for wiring, service and easy access. Our Control Panel has UL approved fittings, whips, switches, terminal block and housing. 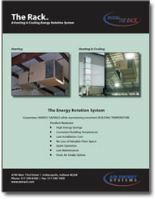 The Rack™ Energy Rotation System – Guarantees ENERGY SAVINGS while maintaining consistent BUILDING TEMPERATURE. In this economy – energy efficient, quality built, and affordable ventilation and air distribution products are critical to keeping building temperatures consistent and energy costs low. To learn more visit AESRack.com, or cotact the Air Energy Systems sales office at (317) 290-8500 or email contact form. View additional “The Rack” case studies here. Case Studies prove The Rack™ is the best solution for Metal Buildings. To learn more visit AESRack.com, or contact the Air Energy Systems sales office at (317) 290-8500 or email contact form. SOLUTION: By putting The Rack™ ER systems in the corners, they eliminated any future need to move the systems regardless of how the building space was subdivided. Along with not moving the systems, they increased the comfort level in the space and reduced the energy costs to the tenants. 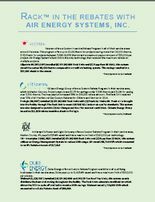 RACK™ in the Rebates with Air Energy Systems, Inc.
Air Energy’s The Rack™ energy rotation systems save businesses thousands of dollars in energy savings and thousands more in rebates. $.75/therm for projects between 7,500-24,999 therms and a maximum payout amount of $50,000 per project. 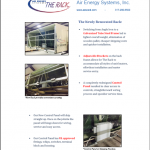 Air Energy System’s Rack Unit is the only technology that received the maximum rebate on multiple projects. Allpoints #6 (950,000’) installed (8) ER-242-800 Rack Units and (2) Rupp Ram 30 MAU, this system saved the owner 93,196 therms compared to a traditional heating system. This savings resulted in a $50,000 check to the owner. Citizens Energy Group offers a Custom Rebate Program in their service area, Marion Country. Project payouts are $0.75 for savings under 7,500 therms and $1.00 for saving over 7,500 therms. The max payout increased 30% to $35,000 rebate amount. The Rack Unit received over 70% of all the Natural Gas Custom Rebates for Citizens and Vectren in 2014. Prologis (96,000’) installed (3) ER-242-800 Rack Units with (2) Fresh Air Intake Kit. 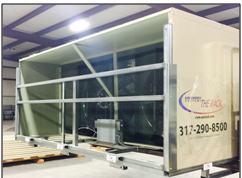 Fresh air is brought into the facility through The Rack Unit to meet ASHRAE 62.1 indoor air quality standards. 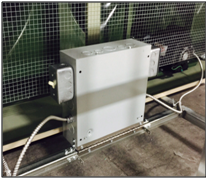 This system was also designed to provide (2) Air Changes per hour for summer ventilation. Citizens Energy Group issued an $11,923 rebate incentive check to Prologis. Duke Energy offers a Custom Rebate Program available to all qualifying businesses in their service area. Duke pays up to $.10/kWh saved and has a maximum limit of $500,000 per project. Walmart (1,228,500’) installed (18) ER-242-800 and (40) 25 Ton Roof Top Units, this system evenly distribute the heat and cooling throughout the facility. The Rack Units eliminate stratification which allows the RTU to cycle off and led to massive kWh savings. Walmart saved 1,726,000 kWh which amounted to a Duke Rebate check of $60,000. In this economy – energy efficient, quality built, affordable ventilation and air distribution products are critical to keeping building temperatures consistent and energy costs low. The Rack™ can be your ideal solution. The Rack™ is Manufactured in the USA by Air Energy Systems, Inc.
Air Energy Systems (AES) recently completed improvements to its Indianapolis head office location. Old carpet was removed exposing 100+ year old oak flooring which was then sanded and finished. 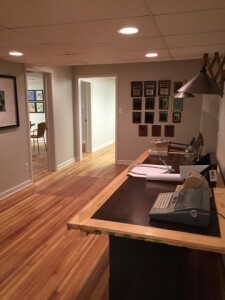 New paint and fixtures were added to make the workspace both functional and attractive. A little history… the AES building was built some time around 1880. 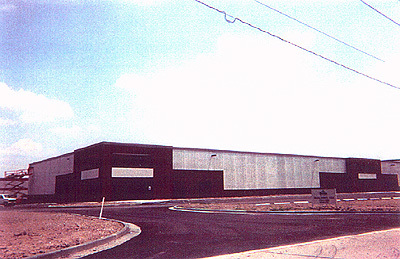 During the 1970’s a private company purchased the building and converted the entire building into office and warehouse space. Air Energy Systems purchased the building in 1994. 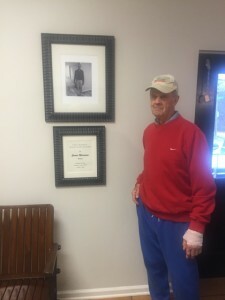 Improvements were managed by longtime New Augusta resident James Warriner. Much thanks also goes to Dotty Maher for planning and overseeing the improvements. Collin Maher (AES Sales) also lent his tremendous energy and talent to the project. The Rack™ Ventilation and Air Distribution “ER Unit” guarantees ENERGY SAVINGS while maintaining consistent BUILDING TEMPERATURE’s. Is the Bitter Cold Causing Problems Heating Your Building? 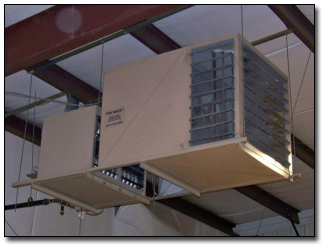 Duke Construction used Air Energy “The Rack” ER systems to increase tenant comfort level in the space and reduce energy costs. 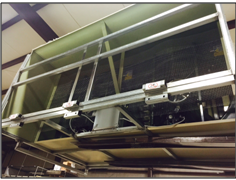 DESIGN SPECIFICATIONS: Duke Construction wanted the design HVAC contractor to explore new ways to upgrade the low heating efficiencies of standard unit heaters and the constant moving of these heaters in their Type 2 spec buildings. Honda’s original heating/cooling design used direct fired equipment incorporated with cooling coils and sheet metal distribution ducting. The warehouse continually exceeded their budget for temperature control and considered eliminating the cooling function all together. AES recommended installing eight 60-ton ground mounted gas/electric rooftop units along with eight (The Rack™) ER-248 ceiling hung air rotation units into the facility. The equipment design increased the air distribution from 192,000 cfm to 400,000 cfm. 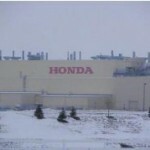 Honda warehouse has less than a 2-3° temperature difference anywhere in the facility. Honda liked the operation of “The Rack™” ER units so well – they installed the same ER units in their next facility located in Sidney, OH – and success breeds more success – as Honda is also installing even more “The Rack™” ER Units in another warehouse facility planned for 2014! In this economy – energy efficient, quality built, and affordable ventilation and air distribution products are critical to keeping building temperatures consistent and energy costs low. Honda knows about cost saving “The Rack™” ER Units …and now you do too. Is your facility warm enough? The Rack™ Guarantees ENERGY SAVINGS while maintaining consistent BUILDING TEMPERATURE. The Rack™ can meet your heating demands whether heating a 10,000 square foot steel building or a 600,000 sq ft multi-tenant structure. The Rack™ utilizes the industry’s most energy efficient heater and combines it with a ceiling hung air turn-over unit. To learn more visit AESRack.com, or contact our sales office at (317) 290-8500 or email contact form.